Traeger is the first pellet grill company and this is one of their largest units. More than just large, this is an attempt at a pellet grill that looks more like a conventional gas grill. Enclosed cabinet, large flip top lid, and side mounted work tables make this look more like what most people expect from a backyard grill. And grill it is. While capable of smoking, this is marketed more as a standard grill than most other pellet cookers. While capable of producing smoke, slow cooking, and doing decent grilling, this Traeger, like all Traeger grills suffers from all the same problems, chief of which is an inconsistency of production. Without spending a lot of time discussing what a pellet grill is, it is sufficient to say that it is a grill or smoker that burns little wooden pellets made from sawdust collected from wood mills and the like. 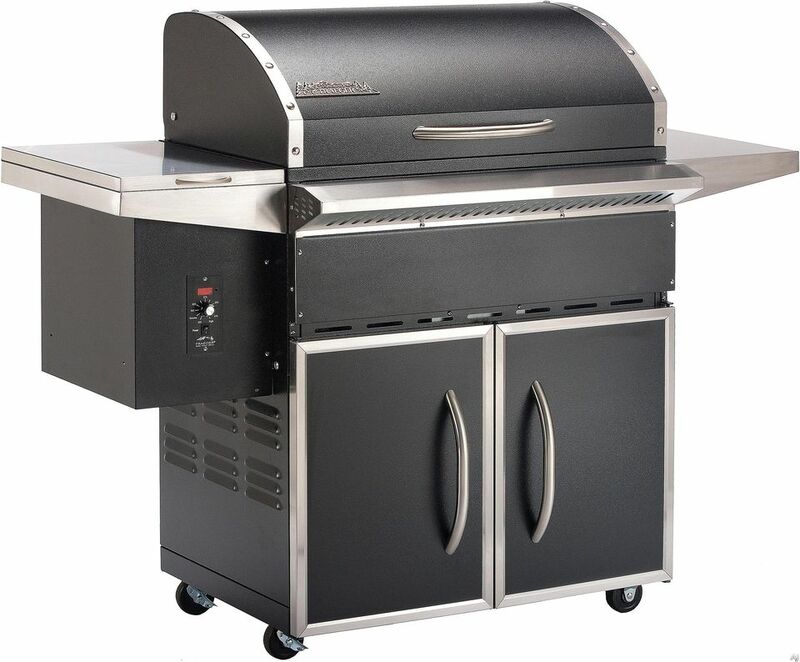 The important thing to know about a pellet grill is that it is mechanically complicated. Where a gas grill is mostly about plumbing to deliver gas to burners, a pellet grill needs an auger (something like a corkscrew) to feed these wood pellets into a small fire pot where they are lit by an electrical ignition system and controlled by a small computer controlled thermostat. The upshot of this is that a pellet grill is operated a lot like a gas grill is, but burns real wood instead of gas. The advantage, according to proponents, is that burning wood produces smoke flavor and that these wood pellets are a renewable energy source. Designed to operate at low temperatures (since it is actually hard to get a system like this to produce high temperatures), a pellet grill is an ideal smoker that can still grill foods, though not at the kind of searing temperatures that a charcoal or even gas grill can produce. This rather innovative technology was invented and the patents held by the people who started the Traeger Pellet Grill Company. I say held, because those patents ran out a few years ago and after monopolizing a small but rather lucrative market, Traeger found itself facing a lot of competition, in fact, more than a lot. Many companies jumped into the pellet grill space the second they could and currently there are more than a dozen manufacturers, most of whom are imitating the Traeger design. To deal with all this competition, Traeger made some rather dramatic changes, the biggest of which was to ship the manufacturing of their grills from the Pacific Northwest of the United States to China, in order to hold down manufacturing costs. The Traeger Select is another of those innovations. Designed to look a lot more like a conventional gas grill, this pellet grill has met with some success by being the subject of special sales at retailers like Costco. With a large cooking space and simple design, this appears to be the pellet grill for the uninitiated; after all, most people still don't know what a pellet grill is. Since this looks like a regular grill it is easier to get people to lift the lid and see what it is all about. Typical of Traeger Grills and relying on their standard pellet controller (the electronics that control temperature and the pellet feed rate), this grill has an operating temperature range of 180 to 450 degrees F/80 to 230 degrees C, a perfect range for smoking foods and barbecue, but low for serious grilling. The problem here is the inconsistent quality control. Buying this grill is kind of like rolling dice. It could be a competent pellet grill that does everything advertised. On the other hand, it could suffer from a number of problems, from assembly issues to peeling paint, to faulty controllers. Traeger's typical answer (while still under warranty) is that they will send out parts to fix all the issues, even if that means you spending your weekends repairing a series of problems. With all the competition out there these days, there are better solutions. Should You Buy the Blaz'n Grill Works Grand Slam Pellet Grill?